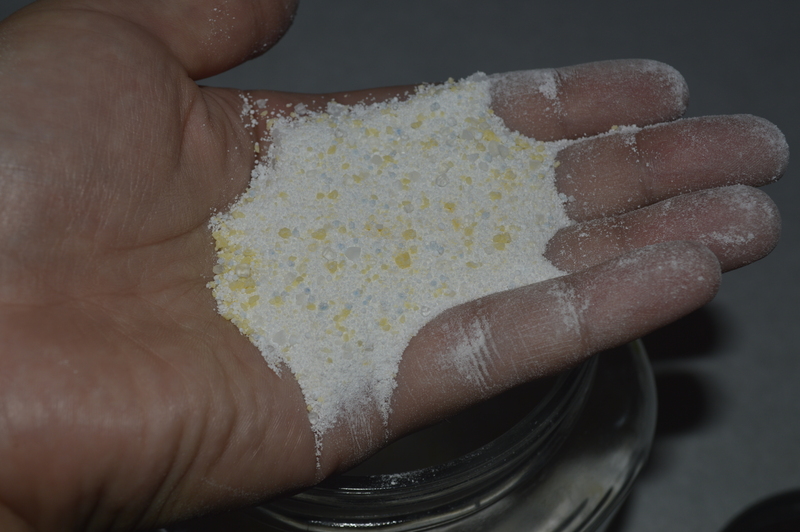 I used to make laundry soap with one bar of castile soap, some washing soda, and borax, but now I decided to go back to something similar to the one I first made, with some changes. It seems to work so much better and everyone that’s tried it LOVES it! It really cleans your clothes, smells nice, and when I hang towels out to dry…I don’t have to fluff them in the dryer after! They are soft! (Not soft like just out of the dryer, never saw the light of day soft, but softer than ordinarily hanging out towels after using commercial chemical laden products). I don’t make a whole year’s worth since I think it gets “stale” (for lack of a better word) after several months. So I make enough for about 4 months or so. I will include a price breakdown below. Grate your bar of soap with a cheese grater, or throw it in your food processor. (I used my Ninja Pulse blender and added about 1 cup of oxy clean to the soap to help break it up). Add the Epsom Salt to the laundry soap and mix until it’s well incorporated. This batch makes 11 1/2 cups of laundry soap. You only need 1-2 Tablespoons per load. Usually only 1 for HE Washers, but I use 2 Tablespoons in the HE Washer and I just put the powder right in with the clothes. It dissolved in cold water too! I absolutely love this stuff! You need to buy the products up front even though you don’t use it all right away. This cost is going to be around $30 at Walmart. Each batch can do 92 – 184 loads depending on whether you use 1 or 2 Tablespoons. That is only $0.04 -$0.09 per load!!! Have you ever tried any homemade laundry soap recipes? A friend made liquid laundry soap for me and it worked well. I have not made my own. I might try your recipe. Thank you. I’m sure you will love this recipe Judy! It’s great too because you don’t have to wait for water to boil or the liquid to set. You just mix it and it’s ready to use!